I've lost track of the number of time that I have sat down to write this post over the past few weeks. I'd like to blame writers block, that glamourous state of apparent blankness which has, I'm told, birthed many of the great literary works of the modern world. Safe to say I have not been teetering on the edge of anything remotely groundbreaking. I'm just busy. And hard as I find it to admit, I'm struggling a little bit. I am juggling my job with an evening cookery course (which is actually incredibly exciting - more of that later I promise). I'm trying to do all of my course homework to my best ability, and spend time practising all the new skills that I'm learning. I'm trying to make time for my boyfriend and my friends, who all have busy lives too but seem to manage not to moan about it. I'm promising myself that when I get home, I will make cookies and take photos and remember to use the right hashtags on Instagram. But when I do get home, I'm tired. I've worked a full day. I've run for three buses and still had to sprint half of the Goldhawk Road to make it to my course on time. I've spent all evening eating meringue at various stages of rawness and now feel confused as to whether or not I'm hungry. I'm frustrated at myself for being too tired to make cookies and take photos and to remember to use the right hashtags on Instagram. Given all of the above, I'm much more prone to cry about things that don't really warrant it. Like last night, when I got home to find a washing machine full of dry, unclean clothes, a message on the screen flashing, "press play to start". In lieu of those aforementioned (and as yet, unexistent) cookies, I give you my perfect Valentine's Day gift. Yes, as much as it scares me to admit, the holiday of love is just around the corner. Is it just me that is still writing 2016 and seems to have missed January? Valentine’s Day falls at one of the leanest times for British produce. Against the bleakness of British winter, delicate forced rhubarb is the rare exception. Grown in Yorkshire and ‘forced’ from the ground with artificial candlelight, this variety of rhubarb is slender, sweet and vibrant. With its romantic beginnings and pretty pink hue, it’s the perfect ingredient to bake with for someone special. 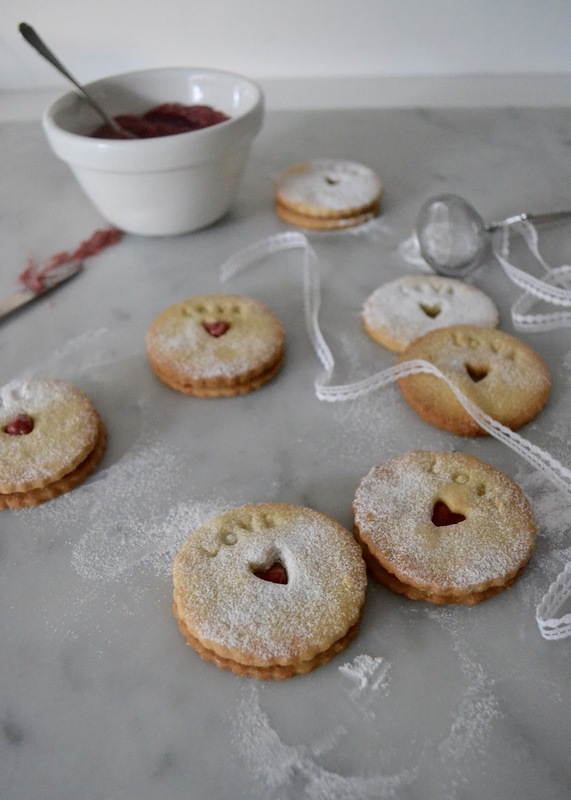 Linzer biscuits hail from Austria, and are traditionally made for special occasions. This recipe pairs seasonal rhubarb with amorous rose for a romantic twist on a European classic. Cream together the butter and caster sugar. Beat for 3-4 minutes until it is light and fluffy. Add the vanilla, and then the egg yolks one at a time, beating after each addition. In a separate bowl, whisk together the flour, ground almonds and salt. Add this to the wet ingredients, and continue beating until the mixture just comes together into a soft dough. Divide the dough into two, and wrap each half in cling film. Chill in the fridge for at least an hour. While the dough is chilling, make the jam. Trim and chop the rhubarb into batons, then place in a heavy-bottomed pan along with the sugar and the salt. Heat gently, stirring until all the sugar has dissolved. Bring to the boil and cook for around 10 minutes, then turn down the heat and simmer for a further 10 minutes. The jam is ready when it reaches 105°C. Remove from the heat and leave to cool. Once it reaches room temperature, stir through the rose syrup or rose water. Preheat the oven to 180°C / 160°C fan, and line two baking sheets with parchment. Unwrap one half of the dough and roll out thinly on a well-floured surface. The dough should be 3-4 mm in thickness. 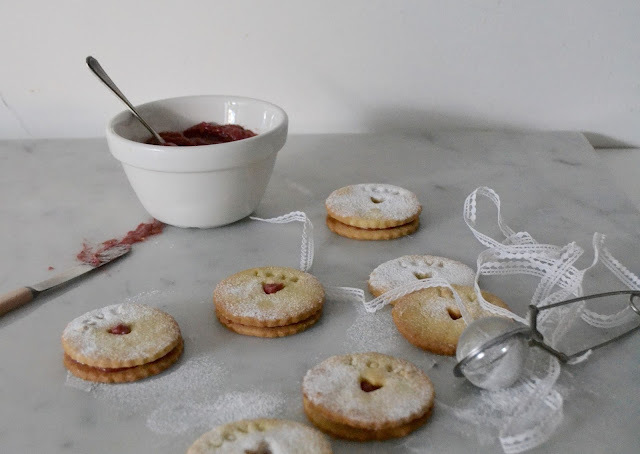 Using a 6cm fluted cookie cutter, cut out the biscuits as close together as you can. Using a 1.5-2cm heart-shaped cookie cutter, cut out the centres. If you like, use small letter-stamps to stamp out a Valentine’s message. Transfer to the baking sheets and chill in the fridge for 20 minutes. Bake the cookies for 8-10 minutes until the edges are just starting to colour. Repeat the process with the second half of the dough, but this time don’t cut out the holes in the centre, as these will be the bases. Once all the cookies are baked, leave them to cool completely on a wire rack. Dust the tops with icing sugar. Spread a thin layer (around 2 tsp) of the rhubarb jam over the bases, then sandwich both sides together. 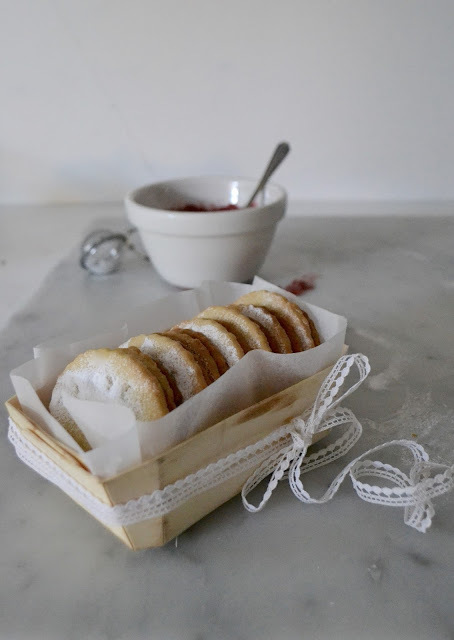 If you are giving the cookies as a gift, line a small box with parchment or tissue paper, pack up the cookies neatly, and tie with lace or ribbon. This recipe was first published in the Bright House Seasonal Food Journal in January 2017.